Harold Saxton Burr (April 18, 1889 – February 17, 1973) was E. K. Hunt Professor of Anatomy at Yale University School of Medicine and researcher into bio-electrics. The Universe in which we find ourselves and from which we can not be separated is a place of Law and Order. It is not an accident, nor chaos. It is organized and maintained by an Electro-dynamic field capable of determining the position and movement of all charged particles. For nearly half a century, the logical consequences of this theory have been subjected to rigorously controlled conditions and met with no contradictions. He was born in Lowell, Massachusetts in 1889, to parents Hanford Burr and Clara Saxton. He studied in public schools and at the Technical High School in Springfield, Massachusetts. In 1908 he was admitted to the Sheffield Scientific School at Yale and received his Ph.B. in 1911. On December 27 of that year, in Chicago, he married Jean Chandler, with whom he had a son, Peter. In 1914 he was appointed Instructor in Anatomy at Yale. He studied for his Ph.D. under Ross Granville Harrison, which he received in 1915. He was a teacher at Yale until 1958, becoming an Assistant Professor in 1919, an Associate Professor in 1926, and Professor in 1929. Most of his later life was spent in New Haven. From 1916 to 1956, Burr published, either alone or with others, ninety-three scientific papers. Early studies mostly focused upon the development of the meninges and other neural bodies, often studying the amblystoma or larval salamander. In 1932 his observations of neuro-cellular proliferation in the amblystoma led him to propose “An Electro-Dynamic Theory of Development” for which he is now most widely remembered. In 1935 he published (with F. S. C. Northrop) “The Electro-Dynamic Theory of Life” and (with C. T. Lane) “Electrical Characteristics of Living Systems”. Burr is noted for his use of the voltmeter to detect the electric potential of the body, first reported upon in his 1936 paper (with C. T. Lane and L. F. Nims) “A Vacuum Tube Micro-voltmeter for the Measurement of Bio-electric Phenomena”. Burr proposed the term “L-Field” for the bio-electric fields of living systems. Burr’s research contributed to the electrical detection of cancer cells, experimental embryology, neuroanatomy, and the regeneration and development of the nervous system. 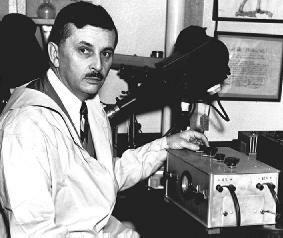 His studies of the bio-electrics of ovulation and menstruation eventually led to the marketing of fertility-indicating devices. His late studies of the electrodynamics of trees, carried out over decades, suggested entrainment to diurnal, lunar and annual cycles. He also contributed a few papers on the history and sociology of his field. Burr’s book, The Nature of Man and the Meaning of Existence (1962) was an attack against materialist philosophy. In the book Burr wrote there is order in the universe, unity in the organism and man is endowed with a soul. His book Blueprint for Immortality, published late in his career though he based it upon work carried out over decades, contended that the electro-dynamic fields of all living things, which may be measured and mapped with standard voltmeters, mold and control each organism’s development, health, and mood. He named these fields fields of life or L-Fields. Burr compared the L-field to the entelechy of Hans Driesch and the morphogenetic field of Hans Spemann and Paul Weiss. Burr used the L-field to explain cellular differentiation and the form of living organisms. According to writer Ruby Khoo in the New Straits Times, Burr’s theory has been rejected by “most scientists.” Burr’s research was continued by Leonard J. Ravitz, a physician who had worked with Burr at Yale. Ravitz has written that ovulation, illness, cuts and scratches can affect readings of the L-field. Burr was a keen amateur painter of waterscapes and landscapes. His early work shows the influence of his friend George Bruestle while his later paintings, now often in pastel rather than oil, became more abstract in design. He exhibited at the Lyme Art Association from 1926–1946 and at the New Haven Paint and Clay Club from 1930-1946.